Here on RTH, we write a fair bit about the corrosive effects of all the abundant surface parking in the downtown core. In contrast to people (usually suburbanites) who claim the downtown would attract more visitors if it had more parking, we argue that the preponderance of cheap surface parking displaces potential destinations that might actually attract people. The idea that there could be too much parking is controversial among people who think exclusively in suburban terms of easy motoring access, but the evidence strongly indicates that urban revitalization requires a commitment to replace cheap parking with actual destinations. In downtown Hamilton, there's so much spare parking capacity that surface lots in prime locations - like the corner of Main Street and Bay Street - sit more than half empty in the middle of a workday. As long as we continue to think of downtown as a place that suburbanites might or might not visit, we will continue to try and reconfigure it to look like a suburban mall - and we will continue to fail at revitalization. When visionary Toronto planners established the King-Spadina Secondary Plan and eliminated parking requirements, the doubters were apoplectic. "How will people get there if they have nowhere to park?" they asked. The answer, of course, is that people and businesses moved into King-Spadina, and in droves. This kind of non-linear thinking still escapes planners and engineers in Hamilton, who make the right kinds of noises about urban revitalization but still refuse to relinquish the suburban values of separation and speed. Hey, I walk through that parking lot on the way to work, it's almost never full, what with all the other lots (some illegal) on the sites of demolished buildings downtown. I guess it would be good to chat with those who wish to see more parking downtown and ask them what their travel habits are when they visit other cities. I'd be interested to know the answer. I certainly have no problem with developing on parking lots, but I'm going to guess that King/Spadina has rapid transit options and neighbouring amenities that King/Bay (or Wilson/John) does not, which encourages the kind of development that can do without parking. Incidentally, it's not merely a matter of thinking of downtown as a place that suburbanites might or might not visit. I'm going to wager that it's a place where most of its white collar workforce does not live downtown (Queen to Wellington, Hunter to Barton), which raises the question: What does it take to convince them to move downtown? Something approximating an upmarket urban experience, in all likelihood, which is something that ideally doesn't rise or fall on massive infusions of public capital. Nobody wants more parking. Parking is plentiful downtown. What people from outside want is cheaper parking. There's nothing like driving downtown and seeing 5 lots, all with fewer than a half-dozen spots consumed, and ignoring them because I don't want to be gouged. The solution to surface parking of course is a successful downtown. When the value of land increases such that the the property becomes more valuable as the site of a building than it would as surface parking, the surface parking should be sold and turned into a building. At the same time, if there really is a demand for parking in a successful downtown, parking lots will grow vertically into parking structures. The fact that it's cheaper to buy and demolish and building and convert the lot into surface parking than it is to build a parking structure is disgraceful. They built the Spadina streetcar at the same time they established the King-Spadina Secondary Plan. B-Line LRT should accomplish the same anchoring effect in downtown Hamilton. Again, coming from Toronto, we couldn't understand why Hamiltonians would complain about parking- either the lack of it or the cost of it. It is incredibly easy to park here, compared to Toronto-- even expensive hospital parking is far more ridiculously expensive in Toronto, and has been for many years. I was paying more to park at a hospital in Toronto 10 years ago than I would pay now in Hamilton.I suppose the hospital parking authorities feel they need to keep prices competitive because there are lots of alternatives for parking here. What people from outside want is cheaper parking. How cheap do you want it? You can park all day for five bucks in downtown Hamilton. In Toronto that would cost you more like $30. Parking here is ridiculously cheap with a few exceptions where the machines are set up for $2 per 30 minutes. How about a clause in any demolition permit with limits on the amount of years someone can destroy a building for surface parking before building must take place? Or better yet, not issue any more permits for parking lots? Why can we not take some of this parking vertical like the York Blvd parkade? I'm convinced that when most people say they never come downtown because of the 'traffic' or the 'parking', what they mean is they don't come because there's nothing to do (that they're aware of). If the same experience is available elsewhere, chances are it comes with free, on site parking. Give people something to do, something that can't be found in the suburbs and they will brave the traffic. Perfect example is the art crawl. - who ever complains about finding a parking spot for that? People come from all over greater hamilton, but to corroborate Ryan's point many have moved to the area. Parking isn't an issue in dt Hamilton. It's the bums and lowlifes that dominate the dt core to the extent that middle class people do not feel comfortable and welcome there. Who wants to buy a condo around the corner from the halfway house, salvation army thrift store, men's shelter, or methodone clinic? There are much nicer places in this city to locate. Until we stop turning the dt into a ghetto nothing will change. That's gross, capitalist. Those "bums and lowlifes" are human beings. Who wants to buy a condo around the corner from the halfway house, salvation army thrift store, men's shelter, or methodone clinic? Apparently a lot of people will....in a vibrant downtown with a ton of destinations and things to do. If your theory was correct (that nobody will come downtown due to 'undesirables') then Vancouver should be the most depressed, boarded up city in the country. At Capitalist. One of the first loft projects in Canada and I think the first large one in Toronto done by Harry Stinson is a place called The Candy Factory. It is at Queen and Shaw St in the west end. I had recently just started working on the Toronto Fire Dept. I remember thinking "who the hell would want to live there?". Reason being it is directly across the street from CAMH formerly know as the Queen St Psychiatric Hospital. The neighbour hood is full of lodging homes which largely house out patients from CAMH. This single building started a catalyst on Queen West moving west past Ossington to Dovercourt. Spin off developments have included restraunts, clubs, boutique stores The Drake Hotel, The Gladstone Hotel. There is absolutely no reason these things can't happen in Hamilton's downtown. It takes a change in mindset and a small group of bold people to initiate change. What we really need is for the city to get out of the way. To reiterate an earlier poing, it isn't a lack of parking; surburbanites are accustomed to FREE parking - like at Meadowlands. They don't see the value in coming downtown to pay for parking to visit the cheques cashing places, bingo hall or dollar stores or plastic shoe stores. Parkdale, the neighbourhood refered to by Shempatolla, is very similar to downtown Hamilton itself. Great stock of heritage buildings, dense areas and shady individuals. Besides a slightly disfunctional streetcar, the thing parkdale and surroundings have that downtown Hamilton lacks is big names! Whether talking retail fashion, quick and sit down service restaurants or accessories of any sort, suburbanites want the names they see on their tv. Within walking distance to Parkdale, you can street shop at more big name stores than you can find in limeridge mall along queen west. You can get more big name restaurants or fast food joints than you'll find in all of Jackson Square. In Hamilton, for example, if you live downtown and want that Danier leather coat you just saw a commercial for, you're going to have to drive 15 minutes to Limeridge Mall to buy it; or heaven forbid a 25+ minute bus rideX2. In "sketchy" Parkdale, you're a 10 minute walk or streetcar ride away. Point is, if dowtown Hamilton is to attract new, young people (suburbanites) it has to attract big name retailers! Wouldn't you visit/stay downtown more often if it had, say, a Chapters, Loblaws, Winners, H&M, Williams-Sonoma or whatever your favourite store happens to be? Who cares? Fifty years of trying to entice people to come downtown by making it easier to drive/park are an abject failure that has demolished (literally) the very destinations we were trying to entice people to visit. Downtown has to stop trying to be what suburban visitors want it to be and become what its residents need it to be. Only then will it attract the additional residents and businesses that will push it over the hump to vitality and sustainability. Once that happens, suburbanites will happily accept the minor inconveniences required to visit, including taking transit and paying a premium for parking. My problems with parking downtown aren't the all-day parking situations. Those are great. I would love to work downtown and pay that. The problem is "I want to go out for dinner, let's go to Slainte". Most lots will have an inscrutable system where "oops, you crossed the magical 6pm threshold that means we get to charge you for both the daytime and evening price, cough up $8 for a 2-hour outing!" Downtown parking is geared for people who work there. People who want to go and shop there or eat there get a minefield of tricks that will end up costing more than your appetizer. For those things, the meter parking is great... but meters are usually taken (and often intimidating to suburbanites). @Pxtl Light Rail will help with that. Just jump on the tram and ride downtown in comfort, no parking fees required. Huge, unrelenting, soulful sigh about here. There's nothing quite like seemingly blinkered vision and misunderstanding to derail and in fact corrupt healthy dialogue. That it's found here, on this site, is even more sigh-inducing. 2 ways, 2 people, that means that tickets for the fam will cost as much as parking... and heaven help me if I want to pay cash. At least hopefully LRT won't have bus-drivers that give my wife the stink-eye for daring to keep one of the kids in a stroller on the bus (and have a similar opinion of operating the wheelchair ramp for said stroller). Honestly, if I worked downtown this would go great - I'd buy an HSR pass and thus have free access to the system for recreation and shopping as gravy, etc. Dammit, I want a downtown job. Pity. Actually, once my younger one is old enough, my plan is just to bike it now that they've got that path across Victoria Park connecting Napier to Head. Apparently you're not supposed to put infants in bike trailers, sadly. Don't you think downtown renewal will increase your shot of being able to get a job downtown? I'm sorry, but downtown isn't an amusement park. It's a neighbourhood. The heart of the city. Bring in 10,000 new residents and some big name retailers as mentioned above and we'll be on our way. If someone from the Meadowlands or Mountain never comes downtown again it doesn't matter. Successful cities are 24-7 cities, not 9-5 cities. We waste so much time in this city begging suburbanites to "please give us a chance". I echo Ryan's sentiment - who cares? The young generation wants to live downtown and lately have been snapping up lofts, condos and homes with a vengeance. Thousands of more quality housing units are what we need. Not theme park promises and free parking. Of course I do. I live in Westdale - not exactly out in Waterdown or something. I love going downtown and shopping and eating there. I'm just trying to highlight the fact that while it may look like parking is plentiful and convenient for folks a little further out, it really isn't. Hamilton has plenty of parking, but it's not actually parking that helps boost downtown retailers or restaurants - it's mainly aimed at all-day users. That's my point... that as contradictory as it sounds, even though I do drive downtown and do get frustrated by parking there, I wouldn't shed a tear if all those surface lots magically turned into skate-parks and hot-dog stands. It looks like Capitalist went off his meds again. Pity. That picture looks like Wilson around Hughson and John. But there isn't enough parking downtown for a new West Harbour Stadium... getting bitter again. I have to agree with Andrea on the expectation of suburbanites on having free parking, no matter how cheap Hamilton parking really is. I also agree that maybe it's time to stop discussing enticing suburbanites downtown, they simply do not want to come. When I first moved to the suburbs you should have seen the reactions from the neighbors when I told them where I moved from, it was amazing. About half showed the kind of sympathy you give to someone with a terminal illness and the other half looked at us like we had a contagious illness. The people out here loathe and fear downtown Hamilton, let it be a local neighborhood and grow it's own charms organically. Get some students living in the Royal Connaught to provide some spending and energy. Convert the downtown expressways to 2-way traffic. Build the LRT. Do these things for the folks living there, not for some dream of having the suburbanites migrate to the core once or twice a month for amusements. It has been said here by others that Hamilton is really two cities, I have now lived in both and I couldn't agree more. For that fancy leather jacket, I'd suggest Leathers on King by Mary. Look around folks - there's a lot more to downtown than halfway houses. Or one of the many vintage/used/thrift stores - even most of the pawn shops have at least one Danier. My Danier leather jacket was $50 at Deja Vu (King @ Hess), for the record. And there's nowhere in the region I've found that compares with Tundra Leather. As for parking, it's obscene. The only kind of parking that tends to have real benefits for retailers and streets is on-street. Even a block or two away and all the block-wide lots on earth won't save you. Downtown is proof of that. It's never hard to find free parking downtown in the evening if you're willing to look around and walk a block or two - especially along Jackson by Slaintes. There is no shortage of parking downtown. If this isn't enough, I don't know what could be. After No Mean Feat in Westdale closed, I didn't know where to go to buy good shoes. I was delighted and grateful to learn about Miller's on James North, which is if anything even better than NMF was. Did anybody say there was a shortage of parking downtown? My only complaint is a shortage of street-side parking, and that's only because street-side parking is the only one that is reasonably priced for short stops. The lots have no interest in getting business from retail or restaurant customers - they want the day-in day-out 9-5 parked commuters. Honestly, if it isn't downtown, I probably don't need it anyway. Additionally, I would much rather support an independently owned business than a conglomerate anyway. Downtown can restore it's 'destination' status on the merits of invidual entrepreneurs and small business owners. 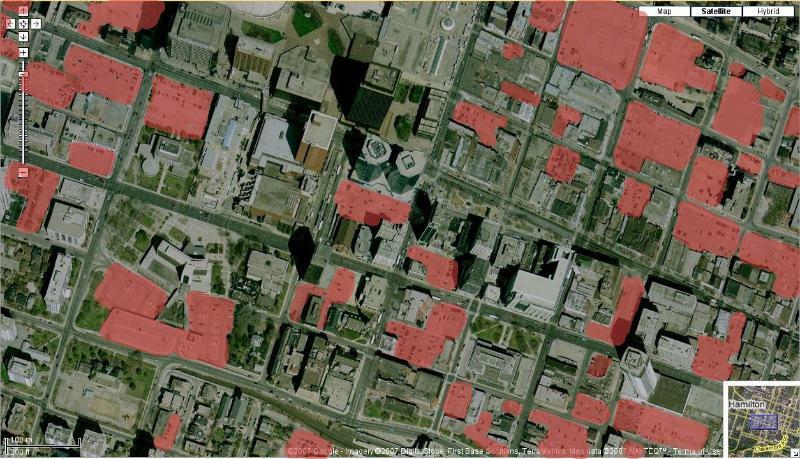 Self-identifying as a noble bubble is all very well and good, but once again, the downtown's greatest failing -- and here I'm defining downtown by the BIA map -- is its weak density of residents with large amounts of disposable income. Wall off downtown now and you're not looking at an especially attractive picture – especially when you consider that features such as Copps, Hamilton Place and the AGH are built around mandates much larger than Queen/Wellington/Hunter/Barton. Are parking blocks an eyesore? Yes. Is lack of parking a canard? Pretty much absolutely. Will downtown thrive without relating to the rest of the city? No. Should it do so by compromising its (pardon the pun) core identity? No. But neither is it perfect as it stands. Nor is its commercial/residential formulation beyond reproach. If downtown had a sufficiently compelling and high-quality retail/dining/entertaining mix and pent-up demand for sophisticated high-density residential options, some perceptive soul would be breaking ground on one of our many centrally located greyfields and cackling en route to the bank. Perhaps they would choose the CIBC at King and James, in knowing recognition of the fact that those towers were the last major privately funded new build in the city's downtown. "Downtown has to stop trying to be what suburban visitors want it to be and become what its residents need it to be. Only then will it attract the additional residents and businesses that will push it over the hump to vitality and sustainability". Who do you mean when you say 'downtown'? I know what the downtown is. The way you've used the word in that sentence, you make it sound like it has a choice in the matter. When did it start trying to be what suburban visitors want? How do you know this? When did it stop being what it's residents need it to be? Was this caused by the wants of suburbanites? How do you know this? What do the residents need? What is your reasoning that residents and businesses will be attracted "only" when the resident's needs are met? How are the needs to be met without new businesses and residents? I could care less how Hamilton is revitalized. Do it with or with out suburbanites. As long as it happens, I'm happy. The above questions are meant to be thought provoking, not hate provoking. Who do you mean when you say 'downtown'? I mean that part of the city that is roughly urban in form and roughly central in position. I mean that part of the city that was originally built before the Second World War. I mean that part of the city that was designed around a transportation mode other than easy motoring in automobiles. I mean that part of the city that land use planners consider to be within the urban zone, as opposed to the suburban zone, the rural zone and the natural zone. The way you've used the word in that sentence, you make it sound like it has a choice in the matter. For fifty years, city leaders have tried to force the downtown to operate like a suburb by offering easy motoring and abundant parking. I am firmly of the opinion that this hasn't worked out very well. When did it start trying to be what suburban visitors want? The City started forcing suburban values on the downtown in the 1950s. It began with the removal of the existing streetcars when Canada Coach Lines, a bus company, bought the HSR and converted it to buses and trolleybuses. It continued with the conversion of all major streets to one-way traffic flows in 1956, a decision that business owners recognized as harmful to urban vitality almost immediately. It continued with the unrestricted growth of suburban sprawl through the 1950s, '60s, '70s, '80s, '90s and the past decade, including the construction of highways serving the suburbs and opening up ever-more greenfield land for development. It continued with the wholesale demolition of entire city blocks in the 1960s, '70s and '80s that destroyed the existing vitality of the urban fabric and replaced it with suburban mall-like megaprojects that rejected their surroundings and held the pedestrian - the basic unit of urban life - in utter contempt. It continued with the demolition-by-neglect of a huge number of buildings surrounding the "renewal" megablock, most of which ended up as surface parking lots that now sit half-empty. It continued with a longstanding policy of holding suburban development charges so low that each new house that is built actually costs the city money. It continued with the imposition of a restrictive zoning system, based on spatial separation, segregation of uses and mandatory parking requirements, onto the downtown to deter reinvestment. When did it stop being what its residents need it to be? This happened progressively over the past 60 years of cumulative abuse and erosion of vitality. Was this caused by the wants of suburbanites? It was caused by the assumption that what is good for the suburbs is also good for the downtown, and what works for the suburbs works for the downtown. It was caused by the assumption that no one wants to live in a city anymore - that suburban living is the ideal to which everyone should, and indeed does, aspire. It was caused by the postwar belief that everyone can and should be able to drive everywhere in a car. Safe, friendly, attractive streets that support a variety of modes. Population density high enough to support many diverse amenities in close proximity. A permissive, performance-based regulatory system that encourages investment and innovation. High quality public transit. An urban built form that maximizes land use. What is your reasoning that residents and businesses will be attracted "only" when the resident's needs are met? Because that is the only thing that has ever worked at revitalizing urban centres. How are the needs to be met without new businesses and residents? It's a chicken/egg problem. The solution is to change what we can in the built form and regulatory structure, catalyze reinvestment through initiatives like LRT, and then bootstrap our way to vitality. Ryan - If Hamilton were the only city with these problems then I would believe everything you say. However many cities that did not convert to one way streets have gone through exactly the same problems so how can it be the fault of one way streets. I have said this time and again 40 years ago the core was thriving, with one way streets. If the one way streets were so damaging there would have been an immediate negative affect on the core but instead it continued to thrive for some years and went into decline at the same time as virtually every similar city in North America. There simply is no cause and affect between the conversion to one way streets and the decline of the core. Even now the conversion of James St. to two way traffic is touted as the cause of its rejuvenation and yet that is not apparent on John St. a few meters away which was converted at the same time. Mr. Meister, yes, there are more factors at play than just one-way streets. Browse RTH and you'll read all about the other factors. But with all due respect, I'm going to listen to the business owners who were affected and lost their businesses because of the one-way change. Browse RTH and you'll read all about the other factors. And Mr Meister will explain away why each of those factors doesn't matter or why Hamilton is "different" from all those other cities that fixed there downtowns and we'll keep doing what we've been doing and we'll end up exactly where we are now. Hamilton is crippled by a perennial set of cynics and squelchers who will resist every progressive change that might energize this city out of its doldrums. It is psychologically fascinating but politically frustrating. Mr Meister, I addressed your identical comment in another thread and you never answered. I guess you don't have an answer, you'll just ignore reality and keep posting the same BS whenever you have another chance? At one parking closest to city hall they ask to leave your car key. Will never park there again. Drove on Barton from DT to new centre mall. Was quite impressed, it's prettier than a year ago all the way.